Oil on canvas, 47 x 37,5 cm. This painting belongs to the last series with love as its theme, which Abildgaard painted before his death that same year. It is part of a suite consisting of four paintings depicting ancient love poets. Here, it is the Roman poet Catullus. Among his numerous love poems, the most famous are addressed to a distinguished, married woman, whose real name was Clodia. 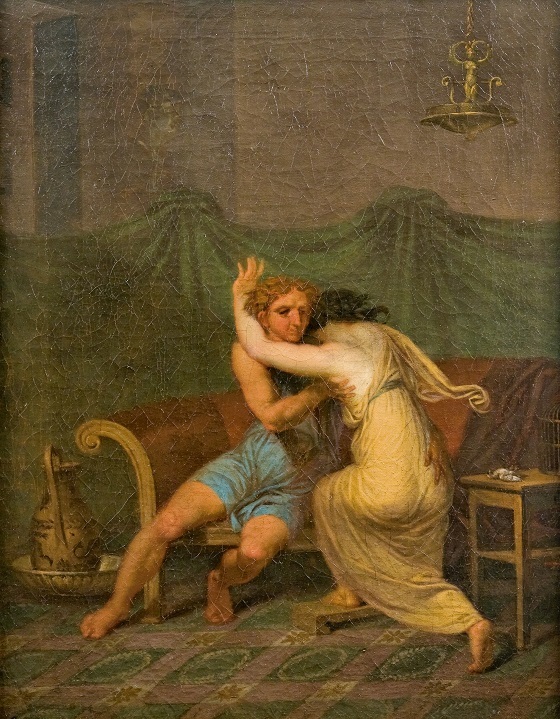 In his poems, he calls her Lesbia, and she is described as a beautiful and promiscuous woman, who cynically lets her love be overcome by jealousy. Catullus describes himself as subjugated and entranced, tormented by love’s anguish and unable to defend himself against the pain Lesbia inflicts on him. The scene in the small painting depicts Lesbia’s despair at the death of her sparrow. The mood is melodramatic and not without a spark of humour.